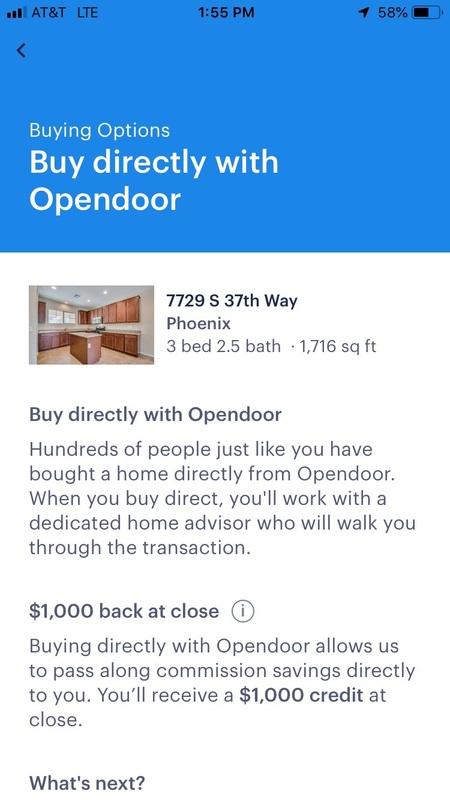 The well-funded homebuying and selling startup Opendoor has made some subtle but important changes to the way it is courting homebuyers in two prominent markets, Phoenix and Dallas-Fort Worth: it’s now offering a more prominent $1,000 credit for buyers who choose to purchase one of the homes Opendoor has for sale in these markets, whether they do so directly on their own, or using one of Opendoor’s “partner agents” — agents from third-party brokerages that work with Opendoor and pay it referral fees. On the other hand, buyers who have an outside agent representing them, who is not in partnership with Opendoor, will not receive the $1,000 credit. Previously, Opendoor listing pages did not prompt buyers to select one of these three options; instead, they were asked to fill out a contact form to receive more information about their options. Take a look at the updated buyer inquiry form for Opendoor’s Phoenix and Dallas-Fort Worth markets. The design tweak reflects Opendoor’s drive to have a hand in as many parts of the real estate transaction as it can, while also leveraging a growing network of partner agents. Opendoor has been serving up at least some version of these buying offers for some time, but buyers previously only learned about the options after contacting Opendoor through a more generic page. 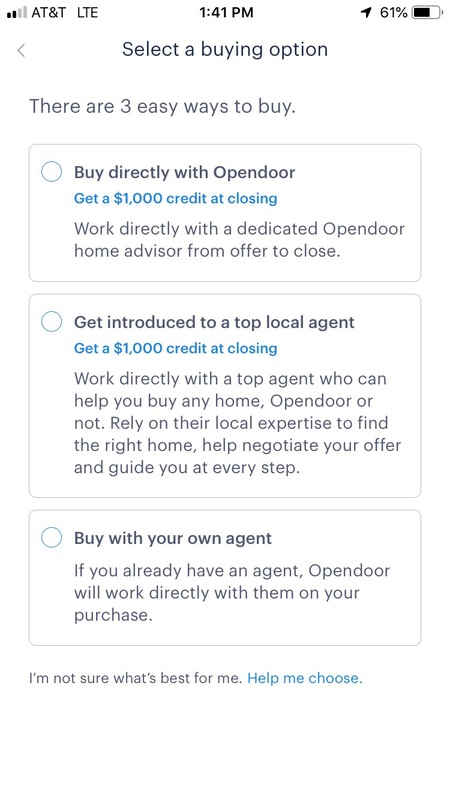 The new default option, “Buy directly with Opendoor,” includes a “Get $1,000 credit at closing” sub-description. Buyers who select this option get taken to another screen that promises by buying direct, they won’t be totally on their own. They will “work with a dedicated home advisor who will walk you through the transaction” — an in-house Opendoor employee. Buyers can then click a “Make an offer” button to submit a bid on an Opendoor home-for-sale online. The next option is “Get introduced to a top local agent,” and it also touts an $1,000 credit. Buyers are told these partner agents will help them buy any home, “Opendoor or not.” But importantly, buyers will only receive the $1,000 credit if their agent steers them to purchase an Opendoor home. The credit is a refund that comes out of the Opendoor partner agent’s commission “in the form of a credit at closing,” a pop-up box also explains. “Buy with your own agent” is the third option that appears on Opendoor’s new buyer inquiry form. Buyers who select it learn that, “If you’re working with an agent, we will coordinate everything from offer to close directly with them,” and are advised to ask their agent to submit an offer to Opendoor’s listing agent. Opendoor’s partner agents also pay referral fees to the company. Agents in these markets can apply for the partnership program at the URL opendoor.com/agents, according to a company spokesperson. But with Opendoor already operational in 16 markets and aiming for 18 by the end of this year and 50 by 2020, it is not difficult to imagine this program expanding to other markets. Buyer inquiry forms accessible from listings in other Opendoor markets also show the same three buying options — without the $1,000 credit offer. Notably, buyers don’t get a better discount by purchasing directly from Opendoor than by working with a partner agent. In both cases, the credit is $1,000, casting the two options, at least in terms of upfront pricing, as equally attractive. The design change shows how Opendoor continues to build a real estate train track that will allow the iBuyer to control, or at least supervise, all facets of the buying and selling process. It’s also an indication that the iBuyer is ramping up efforts to build mutually beneficial relationships with select agents, beyond simply paying compensation to buyer’s brokers through the multiple listing service. Opendoor’s acquisition of brokerage and referral platform Open Listings, announced earlier this fall, also showed the iBuyer has big plans for leveraging agents at other brokerages. Part of the point of the Open Listings acquisition was to offer a home “trade-in” experience that would allow homeowners to sell their current home from Opendoor and buy a new one with Opendoor (via an Open Listings agent) in a synchronized transaction. 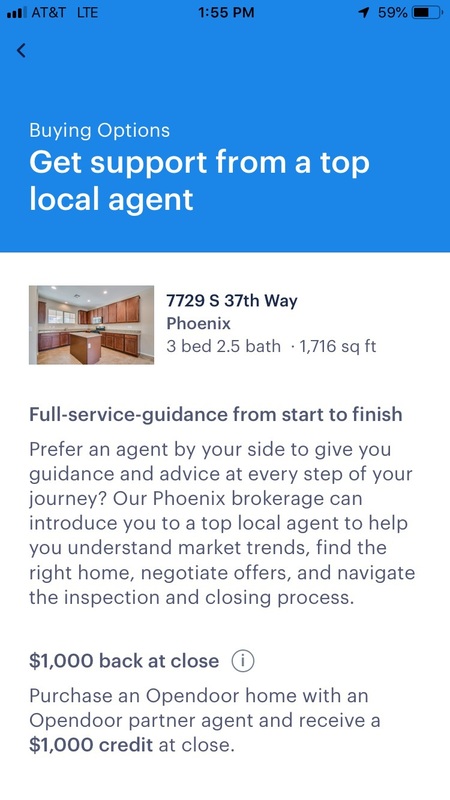 Opendoor is already advertising this Open Listings integration on its website. This article was written by Teke Wiggin from Inman News and was legally licensed through the NewsCred publisher network. Please direct all licensing questions to legal@newscred.com.